More than 20 years since the Navy closed Naval Medical Center Oakland in 1996, government officials, community leaders and SunCal executives gathered on Wednesday, September 12, to mark the groundbreaking of Oak Knoll, a 183-acre master-planned community that will transform the property in the Oakland Hills. Oak Knoll is being developed by SunCal, one of the largest real estate development companies in the U.S. that specializes in large-scale, mixed-use master-planned communities. Oak Knoll will be a mixed-use development that will feature up to 918 homes; 80,000 square feet of commercial retail uses in a village center; and 84 acres of public parks, open space and publicly accessible trails. The community will also include a creek that will be restored to natural conditions; a renovated Club Knoll building that will serve as a new community center for residents and the general public; and a memorial honoring military personnel who served or were treated at the Naval Hospital. 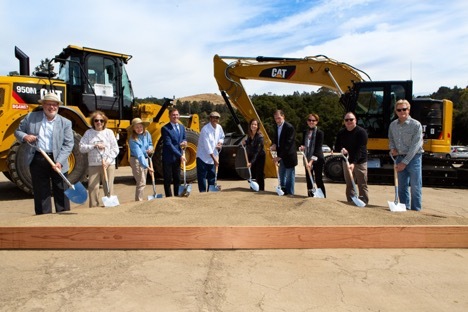 OAK KNOLL GROUNDBREAKING – A groundbreaking for SunCal’s Oak Knoll master-planned community was held in Oakland, Calif., on September 12, 2018. Participating were members of the Oak Knoll Coalition, a community group, who were led by (starting fourth from left, and left to right) SunCal Vice President David Soyka, Oakland City Council President Larry Reid and Oakland Mayor Libby Schaaf.